The major responsibility of chemists is to conduct chemical researches, seek new information and develop a range of materials including drugs, adhesives, synthetic fibers, cosmetics, lubricants and paints among others. Right from food and medicine to computers and plastics, chemicals are used in almost everything we use in our daily life. Trained chemists are responsible for understanding the properties of all these chemicals and manipulate them. Chemists are also involved in petrochemical processing and improved oil refining among others. They perform these tasks with a view to conserving energy and decrease pollution. 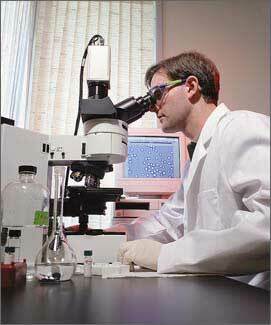 Many of the professionals are involved in research and development work of chemicals. While conducting these researches, chemists study the composition and the properties of matter and the governing rules of the mixture of elements. One field of the research field is applied research where chemists are required to formulate new processes or make modifications to the existing ones. To become a chemist, computer proficiency is also required. Computers are extensively used while performing experimental analysis, simulation and modeling. Very often, these professional choose to specialize in a particular field of their interest – analytical, macromolecular, medicinal, organic chemistry, physical chemistry, theoretical chemistry etc. The minimum requirement for entry level jobs is a bachelor’s degree in chemistry or a relevant field. Candidates who aspire to become a part of a research project should possess a master’s degree or a doctoral degree in chemistry. In addition to the degree, candidates also need to undertake courses in computer science and mathematics to make the most of their careers as a chemist. Today, there are numerous colleges and universities across the United States offering chemistry degree programs for aspiring candidates. According to the United States Bureau of Labor Statistics, the employment growth rate for chemists’ job is expected to grow as fast as the average of all occupations, increasing at the rate of 9% between the years 2006 and 2016. Job prospects will be quite good for chemists with an advanced degree and a few years of working experience. Employment opportunities will be created even as a large number of chemists reach the age of retirement or leave the field for their own reasons. The salary of chemists ranges between $41,053 and $51,288 annually. With a few years of working experience under the belt, chemists can earn around $57,000 annually or more. Salaries of professionals also vary depending on the geographical location. Registered nurses or RNs perform their work abiding by the state rules and laws. However, their daily responsibilities are determined by their work setting. They provide direct patient care, observe patients, assess patient conditions, note the symptoms and also notice the progress in patients. Registered nurses can choose from diverse career possibilities. Candidates who want to become registered nurses should possess a bachelor’s degree in nursing, an associate degree in nursing or a diploma in nursing. A Bachelor of Science degree in nursing (BSN) is required to make a successful career in the field of nursing. There are several colleges and universities across the United States offering a bachelor’s degree, which takes 4 years to complete. An associate degree in nursing may take 2-3 years to complete. The associate degree is offered by numerous community colleges and junior colleges. Those who wish to obtain administrative positions should pursue a BSN or a Bachelor of Science degree in nursing. Nursing education is comprised of both classroom teaching and supervised clinical experience. Candidates gain the clinical experience under the supervision of qualified and expert instructors in hospitals and other healthcare facilities. Clinical experience can be gained in maternity, pediatrics, psychiatry, surgery etc. According to the United States Bureau of Labor Statistics, the employment growth rate for registered nurses is expected to grow at a faster rate than the average of all professions, through to the year 2012. More job openings will be created as a major number of experienced nurses leave the occupation for their own reasons. As the total elderly population continues to grow, there remains a continuous requirement for nurses. There is no dearth of employment opportunities for registered nurses. They can land jobs in nursing care facilities, ambulatory clinics, home health agencies, physician’s clinics, hospitals, public health departments etc. The median annual salary of a registered nurse is around $48,090. The annual salary ranges between $40,140 and $57,490. Those employed in general medical and surgical hospitals earn the highest salary. The average salary for registered nurses working in nursing care facilities is around $43,850. A veterinary technician performs the same task as a nurse does. The career of a veterinary technician can be fulfilling only if you love caring for animals and do not shun from attending to them. The main responsibilities of veterinary technicians include collection of blood samples of animals, performing different tests and analysis of animals. The career of a veterinary technician actually becomes interesting when it comes to taking care of pet-owners. So, while you practice as a veterinary technician, you do not only ease the discomfort of pet animals but also try to comfort their owners. Therefore, the career gives you an opportunity to understand the behavioral attributes of animals as well as experience the bonding that exists between people and their pets. It is actually a veterinarian under whose guidance veterinary technicians performs their task. Though at the very first look the veterinary technician career may look a bit unpleasant, it has its rewards too. The profession of a veterinary technician adds much to your knowledge. During your career, you get to know more about people, their behavior and the love that they share with their pets. The career of veterinary technician makes you aware of how different animals can react in some particular situations. At the end of the day, it will make you feel contented that you provided comfort to an innocent creature. So, you have both physical as well as mental challenges to face during your career. The exact responsibilities of veterinary technicians may differ a little depending on the location you are practicing in. Usually, the veterinary technician would be collecting blood samples of animals, conducting numerous clinical tests, keeping the animal medical history and reporting to the veterinarian under whose supervision they are working. To become a veterinary technician, students can enroll themselves in a 2-year associate degree which trains them in animal anatomy, veterinary technology and animal physiology. These degrees are offered at many universities and colleges across the world. Online veterinary technician courses are also a good option for candidates. If you want to be trained using live animals, you should go to a local college or university rather than earning a degree online. The Bureau of Labor Statistics reports a 41 per cent employment growth rate increase in the coming years. As a result, around 29,000 posts for veterinary technicians will be created in the US. Looking at this increasing employment growth, it can be said that career as veterinary technicians will prove to be very profitable. Pet owners continue to increase in number. Therefore, the requirement for veterinary technicians is also on the rise. The career of a veterinary technician can fetch you an annual salary ranging anywhere between $28,920 and $43,380. Landing a job in government agencies would bring higher earning opportunities. If you are ready to practice in hospital emergency departments, you can look forward to making a career in Emergency Medicine. But the first questions is : What is Emergency Medicine? Well, the vision that the medical students and their colleague actually have about Emergency Medicine is quite limited. One should have a broader vision of what Emergency Medicine actually is. It is actually a medical specialty which deals with patients who suffer from acute illnesses and injuries and need to stabilized immediately. Since patients need immediate attention, Emergency Medicine (EM) trained physicians are prepared to emergency situations. The field of Emergency Medicine doesn’t, therefore, deal with long term treatment of patients. As EM trained physicians, practitioners are required to diagnose emergency conditions of patients and stabilize or provide them relief instantly. Most of the Emergency Medicine physicians have to spend long hours in the emergency rooms of the hospitals they work in. These physicians can provide treatment to patients in hospital emergency departments, via emergency medical services, in the Intensive Care Unit (ICU) or other places or departments where initial medical treatment is provided to patients suffering from acute illnesses. Hope the definition makes it clear about what Emergency Medicine is. The whole idea of becoming an EM physicians is associated with fellowships programs. Emergency Medicine graduates can opt for a number of fellowship programs in Emergency Medicine including prehospital medicine, research, toxicology, sports medicine, ultrasound, pediatric emergency medicine and hyperbaric medicine. The United Kingdom (UK) provides medical trainees the facilities of going for a training program after completion of their five years of medical school and two years of foundation program. The three-year-long program provides training in acute medicine, intensive care, emergency medicine, and musculo-skeletal emergency medicine. Next, the medical students have to get through the Membership of the College of Emergency Medicine Examination. Further a 3-year-long training program continues. Finally, after passing the FCEM, the doctors are eligible to apply for the post of Emergency Medicine Consultant. So, this is was just a brief intro to the question : ‘What is Emergency Medicine?’. Later, we will discuss about the diverse career opportunities in the field of Emergency Medicine.